Not long ago, only birds twittered. Google was a comic strip. 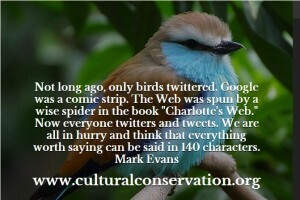 The Web was spun by a wise spider in the book “Charlotte’s Web.” Now everyone twitters and tweets. We are all in a hurry and think that everything worth saying can be said in 140 characters. Technology has provided untold blessings for society. But technology often places great emphasis on speed. Fast computers, faster e-mails and text message, and even the fastest food. People, we are told, have a short attention span. So if you can’t capture public attention with a catch phrase or a quick picture, your message won’t be worth delivering. This same advice is given to all in the arts. “Hurry up,” is directive for composers, writers, and artists. All those thick book and long pieces or music that require concentration are simply out of date and old-fashioned. Modern culture must be evaluated by the speed in which it is delivered to an audience. This is abject nonsense. Certain things in life require attention, study, and concentration. You cannot express the ideas of The Bible or the United States Constitution in a few tweets. Nor can the works of Shakespeare or the classics of English literature be replaced by a series of advertising slogans. Good music requires attentive ears. The Cultural Conservationist doesn’t reject technology; but the Cultural Conservationist also realizes that the best of our culture demands and deserves attention even if it means we must slow down to smell the roses. In the age of high technology, people scramble about, rushing around, doing twenty-four things at once. We need to remember what we may be missing while we are in such a hurry, the songs of a bird and the melodies of life. To learn more about the impact of high technology on our culture, why not start with personal plan of action here?